Hamdan Bin Mohamed Cruise Terminal welcome 2.3 million tourists since the inauguration in 2014. 5 giant cruise ships carrying 23 thousand tourists anchored at the largest Cruise Terminal in the World. Dubai, UAE, January 05, 2019: DP World with a world class infrastructure and a strong robust growth of Dubai as an established cruise hub in the region, Hamdan Bin Mohammed Cruise Terminal the biggest cruise terminal in the world in term of size and handling capacity, receives more than 2.3 million tourists since its inauguration in 2014 and up to till end of 2018. 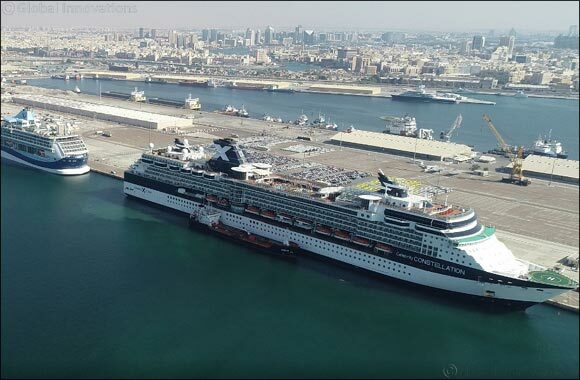 Hamdan bin Mohammed Cruise Terminal recorded a milestone with 172 percent increase in Cruise tourists’ numbers from 2014 with a 232.6 thousand visitors to 2018 with 632.7 thousand visitors, in addition of recorded significant growth of vessels calls from 94 calls in 2014 to 120 calls in 2018. In the year 2015 Hamdan Bin Mohammed Cruise Terminal received around 270.9 thousand visitors, 564.2 visitors in 2016, and 602.4 visitors in 2017. Dubai's vision is to welcome a million Cruise Tourists by 2020, as confirmed by 10 international companies to keep Dubai as their main destination for the winter season 2020-2021, which will support to arrange 10 international cruises starting from Dubai. A variety of sizes of cruise ships between medium, luxury and Mega to meet the various budgets and geographical areas, and explained that the tourist visa which allows them to enter the country multiple times has been an important factor in efforts to attract the Cruise tourists from around the world.